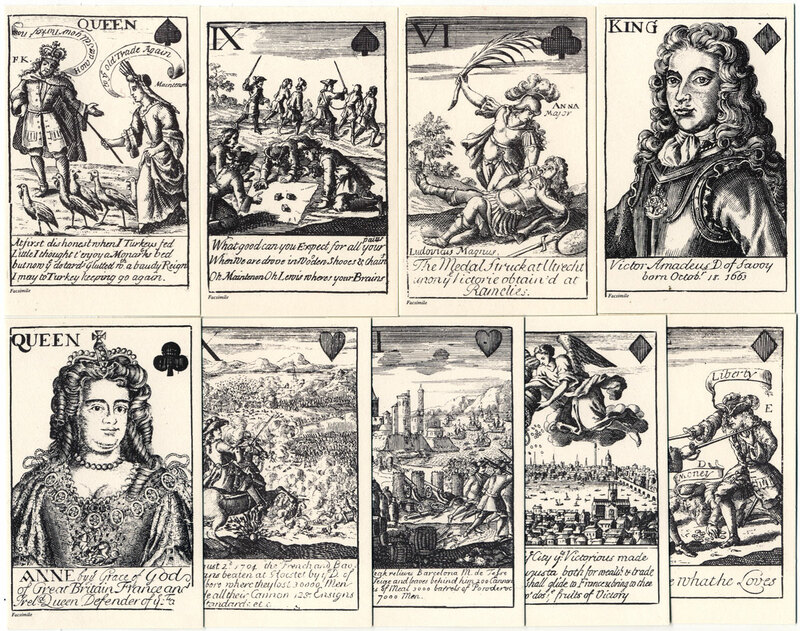 Marlborough's Victories playing cards, first published in 1707, depict Marlborough's campaigns and the personalities involved. The elaborately engraved illustrations cover a variety of European political issues and include portraits of royalty connected with the campaigns. The spade suit comprises almost entirely a series of savage, not to say scurrilous attacks upon the French king, Louis XIV. The pack also sheds an interesting light on the fall of the Duke from public favour. A large number of educational and political packs were published during the 17th-18th centuries. It has not yet been discovered who was the original publisher of these cards, but nearly every pack of pictorial cards since the 1670s except those with marked political involvement were reprinted or reissued by a Fleet Street stationer, John Lenthall from about 1710 onwards. A modern facsimile of this very rare pack is part of a range published by Harry Margary. See also: The Beggar's Opera • South Sea Bubble • Knavery of the Rump • Arms of English Peers • Robert Morden • Cries of London • Transformation Cards, 1811 • Fortune-Telling, c.1690 • Mathematical Instruments • Geistliche Karten.